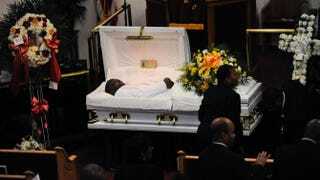 Mourners pay their respects during Eric Garner’s funeral July 23, 2014, at Bethel Baptist Church in Brooklyn, N.Y. The labored breathing of black America has grown more intense since the state-sanctioned choke hold death of 43-year-old Eric Garner last summer on Staten Island, N.Y. You can feel it—chests seizing, eyes watering, in-out, in-out—sharp pain slicing through the hot desperation of a nation struggling not to collapse onto itself. Gil Scott-Heron was right and he was wrong. The revolution has been both live and televised with “pictures of pigs shooting down brothers on the instant replay.” Some people have tuned out, while others have turned up. It is an uprising engorged with the blood of our dead and the righteousness of our rage, causing city after city to catch a fire when it explodes. Though the #BlackLivesMatters movement recently celebrated its two-year anniversary, it moved to the forefront of the nation’s consciousness during the summer of death that began with Garner’s killing on July 17, 2014. Sensing danger, then-22-year-old Ramsey Orta began recording the exchange between “Biggie”—the nickname by which he called the “good dude” he’d known from “around the way” for about four years—and Pantaleo. “He’d give you the shirt off his back,” Orta would say of Garner in a later interview. Because every time you see me, you want to harass me. You want to stop me … I’m minding my business, officer, I’m minding my business. Please just leave me alone. I told you the last time, please just leave me alone. Please, please, don’t touch me. Do not touch me … I can’t breathe. I can’t breathe. I can’t breathe. I can’t breathe. I can’t breathe. I can’t breathe. I can’t breathe. I can’t breathe. I can’t breathe. Eric Garner lost his life trying to be free. He just wanted to be free. On Monday, the city of New York announced that a $5.9 million settlement had been reached with his family, but his mother made it clear that a payoff is not justice. This is not a victory. And the more things change in black America, the more they stay the same. Jonathan Crawford, Michael Brown, Ezell Ford, Tamir Rice, Brandon Tate-Brown, Aura Rosser, Natasha McKenna, Tanisha Anderson, Walter Scott, Freddie Gray, Akai Gurley—the list goes on and on—have all fallen victim to police brutality in the year since Garner’s death. Just this week, two black women, 18-year-old Kindra Chapman and 28-year-old Sandra Bland, were found hanged in jail cells under suspicious circumstances. Each death becomes a wave that pushes us closer to the shores of resistance, refusing to be washed away by apathy and complacency. As beautiful as that sounds, Eric Garner shouldn’t have died at all. And one year after his death, his killer, who was never charged, is reportedly ready to get back to work—while Garner’s family is still struggling to get back to living. It is the tragic bookend to a year filled with pain, rage and reaffirming to one another that black lives do matter—we matter—even when this country tells us on a daily basis that we do not.